Governor Okezie Ikpeazu of Abia State continued the battle to retain his seat on Friday before Justice Okon Abang of Federal Court High Court, Abuja. 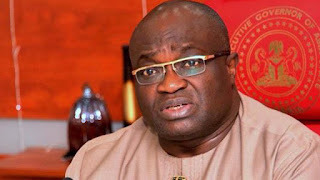 Justice Okon Abang of a Federal High Court in Abuja on Friday refused to hear Abia State Governor, Okezie Ikpeazu’s application for stay of execution of the June 27 judgment of the court removing him (Ikpeazu) as Governor. Abang said that Ikpeazu filed to the appeal court for “stay of execution” of an order removing him as Governor. He directed that Ikpeazu and Ogah, who was ordered to be issued fresh Certificate of Return in the June 27 judgment, should go to the Court of Appeal to argue the motion for stay of execution. He said all these in response to the argument of counsel to both parties, challenging his jurisdiction to hear any application on the matter. It would be recalled that the Abia State High Court had issued an injunction restraining INEC from issuing a certificate of return to Ogah. The Court also restrained the Chief Judge of Abia State from swearing Ogah in while ordering status quo to be maintained until pending the determination of motion on notice.